Wow. What a week. Make that, two weeks. Let me apologize in advance: This will be a long read. April is a month filled with family birthdays. We started April 16th, with Grandson Daniel III turning 4 yrs old. Where did the time go? They had a pool party with over 20 kids. It was a huge splash! Note: There is still frosting on his face! Then, my husband David's Birthday was Friday, April 19th. We celebrated Thursday to surprise him. The kids came for dinner and cake. Sadly, he spent the rest of the weekend in terrible tooth pain, a problem resolved Monday, with an extraction and pain meds! Maybe it was too much cake?! Naw. No such thing. We were really getting concerned that our special trip for my birthday would have to be cancelled. Thankfully he 'pulled' through (pun intended). Snicker. Yea! The birthday plans we made back in September were in full swing! Being a bird addict, I'm sure you can guess what I wanted to do? Yep. Birding. Getting hubby on board wasn't hard. The place we reserved to camp was called, "Dead Horse Ranch." He likes cowboys. It's a win,win. The event, Verde Valley Birding & Nature Festival. We shorten it to "Birdy Verde." Once there, I ran down the dirt trail to sign in at the registration tent. Whoops, no waivers in hand, ran back up to camp for Dave's signature on the form. But wait. A mama Black-chinned wanted to show me her nest. We were there 1/2 hour and I spot this little gem. Now I'm really getting pumped! Mission: The Verde Valley Birding & Nature Festival provides a unique recreational experience to anyone interested in the natural world and fosters awareness of the importance of habitat for the enrichment of all life in the Verde Valley. These birds didn't appear to be drunk! Sadly, this group of 8 or so stayed in the shadows. At dusk, I 'caught' this catcher, sitting pretty. Thursday night, after some quick hugs from our camping friends (more on that later)...I did the "Owl Prowl." We spotted a Western Screech Owl and Great Horned, twice each ...no photos. The guide, Bob Miller, was really fascinating. He lives in the Salton Sea area and has a book about the birds of that region. His profile, blog and book can be found here, http://blog.southwestbirders.com/ centered around Salton Sea. Trip Description: We will be prowling our way around the park in an attempt to spot the great horned owl, the barn owl, and perhaps the western screech owl. They have all been seen here in the past. Bring along a flashlight as well as your binoculars. Friday! My Birthday. It was time to meet Cynthia White and go warbler hunting with Homer Hansen! Trip description, "Warblers are challenging to identify and Homer is not only knowledgeable; he can help you to master this skill. You’ll visit appropriate habitats, and with Homer’s skill, you will soon be able to keep up with the best. Species that might be seen include Black-throated Gray, Nashville, Grace's, Lucy's, Virginia's, and Yellow Warbler, Painted Redstart, Common Yellowthroat, and Yellow-breasted Chat. Box lunch included. Homer will be presenting a workshop on Thursday afternoon where he will go over the basics of warbler ID. We recommend attending this workshop in preparation for this field trip." Great Blue Heron preening on cliffs of Sedona Trails. A House Wren is a common backyard bird over nearly the entire Western Hemisphere...but I'd never seen one! Next stop, Page Springs Fish Hatchery. Warblers were singing high and low, but were very hard to find. Homer heard an Oven bird, sighting it would have made the rare bird alert list. Maybe he'll go back...alone! 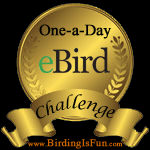 Warbler walks: Looking for a 2.5" bird in a ginormous tree! Which reminds me, Homer got a kick out of my story about, "Homer, My Hummer." I sent him the link to my blog post about Homer. Now they will now each other, sort of. Besides spotting Yellow-rumped Warblers, Black-throated Gray Warblers, Lucy's and Grace's, there were Painted Redstarts, Summer Tanagers and a Cassin's Kingbird. The entire day was full of birds, sun, sweet people, and we had a crazy bus ride (understatement) back to camp. After the warblers, a walk far too long for me personally...it was time to party at the campsite! Our friends, mentioned earlier, Bonnie and Libby, with their Bernese Mountain dogs Halle and Yogi, were down from Flagstaff. We threw on some blue cheese burgers and they brought over some lovely cheese cake! Yummo. Libby's birthday was a few weeks back, so we had a triple celebration. We spent the night talking away, all the while knowing we had to be up early for the canoe trip. David gave me some gifts, my favorite being the new birding/camera vest from Sportsman's Warehouse. I'm so lucky and so spoiled. Description: On this, our signature trip, we will be taking canoes down the Verde River for a different perspective of the riparian habitat. We will beach the canoes at a private residence and be treated to a home-made brunch. Experienced paddlers pilot every canoe so you can sit back and enjoy the river’s surprises. There’s always the chance that you might get wet so wear shoes and clothes that can take the water. Shorts are recommended depending on weather. This trip is dependent upon the water flow. Wearing my new present to the canoe adventure. Ready to get wet, but hoping I don't. David with his guide, Mary. Because I had a miss-hap with my stress level and food intake, I awoke with a swollen face. Exactly one year of this crazy hive condition and I'm really getting good at trudging through the weirdness. Angioedema is what I get and is characterized by deep swelling around the eyes and lips, so I needed to be with a good canoe guide...Chip set me up with Bob. In his role as the expert, we stayed in lead position of 12 canoes which allowed me to have the ride of my life! Bob (Morgan?) was my hero, I got to see all the birds before they were scared away. Surprisingly, I took this photo of a male Summer Tanager from the canoe. We dock canoes, head up an embankment to the quaint Mattia's Ranch. (Only one canoe rolled on landing). In the yard were cages full of geese, turkeys, goats and sheep. First thing I notice is a pizza oven. Oh shoot, I can't eat tomato pizza. We'll have to eat later. I sit quietly, but I'm starving. Soon enough, the hostess Lee Mattia comes over and drags me to her husbands brick oven, "make her a pizza, no tomato!" I'm turning red as the oven fire by then. After some teasing...Ron was so sweet. He let me pick each ingredient...pesto sauce, home made mozzarella, fresh sausage, turkey (from his farm), olives etc. When it was done..everyone wanted a piece! Noooo...it's mine! Ron said so. Lee, is an amazingly gracious person. She kept checking in on me. She gave us a tour of their home and her Cantina room where she caters parties. She and I talked like long lost kin and I didn't want to leave. Vans were honking. Bummer, I had to go. We hugged goodbye and then I kissed the cook! After the canoe ride we went antique hunting in Old Town Cottenwood. Fun times and a must do. Sunday: No set schedule. After a sad farewell to our two favorite camping companions...breakfast was eggs, turkey sausage, hash browns, fruit and Starbucks instant coffee. Our son Joe's 35th Birthday was the 28th. He spent the day doing what he loves, fishing! He caught a 26.5 lb walleye in Pier, South Dakota. We headed over to see the Lagoons at the campgrounds. Some nice birds were hanging out there too. Sunday night: Steak off the grill and reflections. Going home in the morning is always bittersweet. Monday: Still under attack by hives, we make it back in one piece. Special thanks to David. His calm driving and easy nature made for a nice drive home. (We silently both knew...not having the Karmel greet us would be hard). David is my rock. As we pull in the drive...something colorful catches my eye. OMG...what is that? Speaking of rocks...there's a bird painted rock perched by the front door. I start to squeal. Our daughter was by to water plants, she must have left it for my Birthday. How sweet. All birds are 'present' (get it?) and accounted for! She even made Homer the hummer, in two profile views. In all my life I have never been so overwhelmed and touched by a gift. She knows how to get right to my very core. I have no words. Katrina, I dedicate this photo to YOU. Plant I named, "Angel and her butterfly." Bird List: No counts, just names I can remember, all 64 of them. The Chat and Oven bird were heard by Homer and not seen by me.